It is the time of year where skiers thoughts turn towards making ski plans for the 2018-19 ski season. There is a certain calculus to making a ski pass decision. 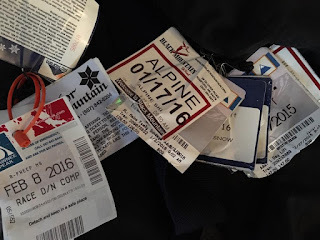 You have to figure out how much time you are going be skiing this year and if you have saved up enough money to plunk down a good chunk of change to make a pass purchase. If you do buy a pass you want to make sure you visit the mountain enough so that the number of trips divided by the pass price is less than a daily lift ticket. Some folks like to have a "home mountain" while others prefer to ski different ski areas over the course of the winter season. We were Saddleback pass holders for a long time. Now that Saddleback is no longer an option, we have migrated to Sugarloaf. For the adults in our family we buy silver level passes. This pass level gives us access to Sunday River and has 12 blackout dates. Our now adult kids get the 20's and college passes. We actually don't mind the blackout dates as it gives us more of an opportunity to ski other areas like Mt. Abram, Black, Shawnee Peak, Titcomb, Lost Valley and other smaller, but awesome, ski areas in Maine. Sugarloaf / Sunday River - They have a myriad of pass options from youth, teen, Maine students, college, adult with varying amounts of access and blackout dates. Prices range from $249 all the way up to $1,439. A Gold level full-access adult pass is $1,199. Most of the pass options allow you to ski Sugarloaf, Sunday River and Loon Mountain in New Hampshire on the same pass. Sunday River is usually the first to open in Maine and Sugaloaf is the last to close and both offer some of the BEST skiing and riding the east. Prices go up October 8th and based on past years, I estimate the price jump will be about $50. Shawnee Peak - Shawnee Peak is a great option for southern Maine as it is close to the Portland area, and offers some really good day and night skiing. They have some interesting pass options like night skiing only, Sunday's only, First Responder's plus pass holders get 40% off tickets if you venture out west to Jackson Hole. Full adult pass is $760 with a variety of age and access options for other pass levels. Titcomb Mountain - This community hill in Farmington has an active vibe with the University of Maine at Farmington and Mt. Blue high school ski communities skiing with the locals. Their website was down at this writing but keep an eye on this link for pass pricing information. The following mountains (Mt. Abram, Black, Lost Valley, Big Rock and Camden) have partnered to offer half prices tickets. So if you buy a pass at one mountain, you can buy half price day lift tickets at the other mountains in this group. Mt. Abram - This great ski area in Greenwood has a variety of pass options from little tots, teens, adults, full family and 80+. There is some tremendous skiing at this mountain and has a great, separate learning area with its own lift providing a great option for families. We always make sure to get to Mt. Abram at least a couple of times a year. They are generally open Thursday - Sunday and holiday weeks. Full adult pass is $609 with a variety of age options. Lost Valley - Located in Auburn, this great learn to ski / have fun ski hill that is easily accessible and under a second year of new ownership. They have recently opened an on-mountain brewery. They also offer great night skiing and are open 7 days a week during the peak season. Adult (13 and up) passes are $499 with child, junior and family options available. Big Rock - This mountain located in Mars Hill up in Aroostook county offers some tremendous skiing. We have skied here a couple of times and have really enjoyed it. One of the bigger of the smaller Maine ski areas (1000 foot vertical drop) with terrain for all abilities. They are generally open Wednesday - Sunday and holiday weeks. Keep an eye on their web page for season pass pricing announcement. Camden Snow Bowl - Not too many ski areas can claim views of the Atlantic ocean and a lot of improvements have been made over the past couple of years including new chair lifts and snow making. There have been some leadership bumps in the improvement road but new management is in place and they are looking towards a bright future. We have had some great ski days at Camden. Early bird pricing currently in place through October 31 (Adult $299 Camden Resident, $429 non-resident) with student, military, youth and senior options. The prices go up quite dramatically November 1 so buy now! Here are links to other mountains in Maine and pass pricing / ticketing information. We haven't visited these ski areas so I offer them without commentary, but all of these areas provide an opportunity to get outdoors in the winter. A must if you want to enjoy all that Maine has to offer!